NEW YORK (CNNMoney.com) -- General Motors is adding four more states -Texas and the Northeast states of New York, New Jersey and Connecticut - to the list of those where the Chevrolet Volt electric car will be available during its initial rollout in late fall, the company said Thursday. 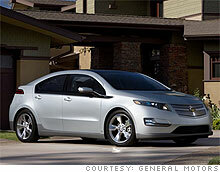 The Volt is now slated to be available in a total of seven markets initially. The others are California, Washington, D.C., and GM's home state of Michigan. "Chevrolet is extending the Volt launch to additional states because of strong customer interest and our confidence in all aspects of the vehicle and battery," said Tony DiSalle, Chevrolet Volt marketing director. Sales in Texas will begin in the capital city of Austin and will roll out to the rest of the state over the following months, GM chief executive Ed Whitacre said in a speech in Austin. Whitacre was born in Texas. Powered by a lithium-ion battery pack, the Volt will be capable of traveling up to 40 miles on purely electric power once it's been fully charged. For driving beyond 40 miles -- total range is expected to be around 340 miles -- the Volt will have a four-cylinder gasoline engine that will generate electricity to power the wheels. Nissan is also expected begin selling its own electric vehicle, the Leaf, around the same time on a national basis. The Leaf will be a purely electric car capable of driving up to 100 miles on a single charge, but it will need to be recharged before driving further. Ford is expected to begin selling a fully electric car, the Focus BEV, next year. To publicize the Volt's advantage in total range, GM employees were to depart from Austin on Thursday driving a Volt, expecting to arrive in New York on July 4, Whitacre announced at the presentation. That's a total distance of 1,776 miles in three days, Whitacre said. "The Volt can handle everything from city commuting to cross-country trips," he said. GM plans to produce 10,000 Volts by the end of 2011 and another 30,000 the following year, the automaker said in an announcement. The car will be available in all 50 states in a year to 18 months after the initial limited roll out.